[prMac.com] Flemington, New Jersey - Children's Technology Review has just introduced what it believes is the world's largest and most up-to-date online repository of reviews of education software and hardware. The Children's Technology Review Exchange (CTREX) is subscriber-supported to reduce bias. It contains 11,708 reviews including the latest K-12 products across 26 types of tablet and gaming platforms, each written from the point-of-view of the "Picky Teacher." Never before has there been a database with this level of speed, ease-of-use, and comprehensive content. Try a search at Picky Teacher online. 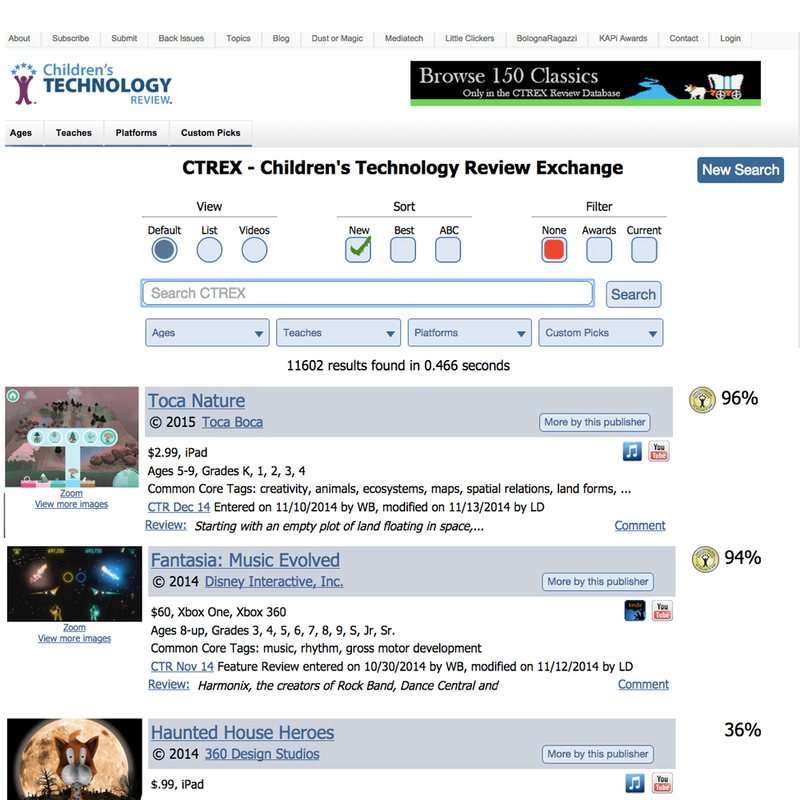 With its intuitive search tools, the CTREX platform and rating system allows teachers and parents to find, evaluate, compare, and discuss educational software and hardware for children from pre-K through high school. CTREX is now accessible today - no registration is required. Rather than wading through anonymous on-line reviews of unknown credibility, CTREX allows educators and parents to quickly zero in on specific products and to compare and evaluate their suitability. Similar products are compared using the same criteria by qualified educators. In addition, subscribers and publishers may respond to a review. "There is no perfect rating system," said Warren Buckleitner, Ph.D., Editor of Children's Technology Review. "However, we can come as close as we can, and then give our readers the tools to fill in the blanks." The CTREX database makes it easy to search and browse by age, curriculum, publisher and technology platform, with additional custom parameters. The service is 100% subscriber funded to avoid obvious conflicts of interest. "CTREX is an alternative for people who have grown tired of gimmicky review sites with outdated information. There are no suspicious ratings, affiliate links, or social agendas," said Buckleitner. "And for the first time, our paid subscribers can learn about a new product the day it's released." Children's Technology Review subscribers receive a monthly PDF magazine, along with a password to the CTREX database. Every Wednesday they receive an issue of CTR Weekly, with noteworthy reviews. Subscription rates are $8/month (4 weeklies plus one issue); $39/6 months (24 weeklies plus six issues); $59/year (52 weeklies plus 12 issues) and $99/2 years (104 weeklies plus 24 issues). For more information about Children's Technology Review, visit Children's Technology Review online or call 908-284-0404 or 800-993-9499. Since 1993, Children's Technology Review (CTR) has been the name of a systematic survey of children's interactive media, with reviews written by "Picky Teachers," reviewers with preschool or elementary classroom experience who have achieved inter-rater reliability on the same review instrument. The work is supported by "clean money," namely subscriber fees, publication sales and Dust or Magic conference registrations. No income comes from sponsorships, selling award seals, grants or affiliate sales programs. Designed for teachers, librarians, publishers and parents. CTR is sold as a subscription, and is delivered both weekly and monthly to subscribers, who also receive access to the CTREX review database. All Material and Software (C) Copyright 2014 Children's Technology Review. All Rights Reserved. Apple, the Apple logo, iPhone, iPod and iPad are registered trademarks of Apple Inc. in the U.S. and/or other countries. Other trademarks and registered trademarks may be the property of their respective owners.